I wrote this when I was President of Grampians Hockey back in 2005. I read it out at the presentation night and then filed it away somewhere. 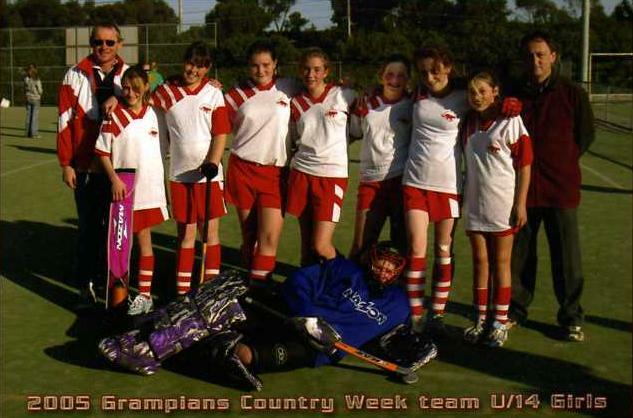 Grampians Hockey has been an integral part of my family’s life for close to fifteen years. Grampians were seen as the weakest country hockey association in the State, which isn’t surprising, because we were more like a club then an association. We always went to country week. Sometimes our boys were competitive, mostly not. The girls found it harder, normally not having enough players to field a side, they either had to play with some other team or occassionally, play with the boys. This was one of the few years that we fielded a girls team and to be honest, most associations wouldn’t have bothered. We did because our girls deserved for once to compete on their own terms. The odds were still stacked against them, but at least they had a chance. In two days these eight girls (yes eight) did more to represent Grampians Hockey in a positive light then any other team I’ve been involved with. I wrote this for those eight girls, Ash Bahl, Bianca Mason, Emily Vearing, Susan Fitzpatrick, Cassie Jaensch, Alice Fresle,the then little Katie Hillier and of course, my daughter Beck. If anyone ever writes the history of Grampians Hockey Association these are eight names that should be written in gold….. I have eight new sporting heroes. You won’t find them in the glossy pages of Sports Illustrated or even on the back page of the local rag. They are eight largely anonymous girls aged between ten and fourteen who reminded me over one weekend how winning isn’t the be all and end all. There are eleven players on a hockey team. Grampians Hockey has five senior teams and four junior teams. The teams are mixed and the vast majority of players are male. We took the plunge this year and decided to enter a girl’s team in the under fourteen division of the Country Week competition held in Melbourne over June. We scraped together ten players and were assured that we would obtain fill-ins over the weekend. We lost a couple before we started and nearly pulled out entirely, but reassured that we could access some players we set off early one Saturday morning uncertain of what lay ahead but with eight very excited young ladies determined to put their best foot forward. The first game was against Ballarat. Ballarat chose fourteen players from a selected squad of twenty- four. They all looked close to over age and highly skilled. I had a sinking feeling that we were going to be in for a long weekend and for the first ten minutes nothing happened to change that feeling. Ballarat were finding their feet and could not penetrate our defensive twenty five-yard line, but it looked only a matter of time before they did. Then our defensive line broke and Ballarat swept forward in a line of four. Only ten-year-old Katie Hillier stood between their attack and a clear shot on goal. Katie did not hesitate. She charged to meet the ball carrier and with one deft move made the tackle and swept the ball clear and to the sideline. It was a play that she would make repeatedly over next two days but for me, it was the decisive moment of the weekend. Suddenly senior players who had looked uncertain and timid in the face of the opposition were running hard to defend and attack. They held firm stopping Ballarat in their tracks and mounting several promising counter attacks. Ballarat broke through just before half time, but our team continued to play as if they believed they could win. They probed and attacked Ballarat’s defences constantly but were thwarted by their lack of numbers and a tight defence. Ballarat scored again late in the game, but our players came off buoyed by their competitiveness. There was lots of excited chat about the next game and positive reinforcement from the older girls. We had a team. The next game against Warrnambool was a revelation. Our team of eight dominated general play and came close to scoring just before half- time. Warrnambool looked frustrated and confused as our girls ran them off their feet, but we just couldn’t find the net. When the match finished neither side has scored, but our girls came off behaving like they had won a Grand Final. The bond developing between them was tangible- something you could almost touch. And so the day went, the girls narrowly lost the next match to the eventual winners of the competition and had another draw against Latrobe under lights in the evening but the spirit amongst them was unbelievable. Bianca Mason, Ashleigh Bahl, Susan Fitzpatrick and my daughter Rebecca collectively guided and led their younger team-mates superbly, while the youngsters Cassie Jaensch, Katie Hillier, Emily Vearing and Alice Fresle did everything asked of them. In the evening we caught up with our boy’s squad who were doing extremely well, one of the boys made a smart comment about the girls not scoring, and the girls collectively rounded upon him, asking how well he’d go playing three down. There was something magical at work here – something that made them collectively stronger than they had any right to be. Come Sunday and the girls were ready to win a game. They gave it their best shot in the first match of the day, working extremely hard, but were again frustrated by their inability to find their way past the extra players that the opposition had the luxury of fielding. They never let up, but were just beaten. The effort of competing against the odds was beginning to show. There were some very tired girls. Some of the younger ones were out on their feet and Emily Vearing was struggling with a headache, but wouldn’t hear of missing the last match. They took to the field for the final time, knowing that they could not win but determined to stand together. The cumulative effects of playing against bigger, more powerful teams started to tell, but they refused to surrender. They weren’t helped when Beck copped a full-blooded drive on her ankle, forcing the girls to play even more defensively then usual as she found it hard to run. When the whistle blew they had been soundly defeated, but were unbowed. They had given everything for each other. Bianca and Ashleigh had to literally carry Beck from the field, as she could no longer put any weight on her foot, Emily looked to be suffering badly from her headache and the others looked totally exhausted. Someone else with a well- drilled team and the advantage of a home artificial pitch won the trophy. I’d take our girls any time. Their courage, persistence and grace under pressure mark them as champions in my eyes. Next year we will make sure they have the support of a full team. Next year we aim to win, but somehow I don’t think I’ll be as proud as I am of these eight girls. Sadly of those eight girls, there’s only one (Beck) who is still playing Hockey. At least four of them were good enough to play at higher levels then Grampians- only Beck has. That’s a problem for Hockey Victoria and women’s sport in general I think. If they all lived in Ararat still, they would make a bloody good team, but life moves on, fortunately, sometimes it leaves memories like this one. Right now Grampians Hockey is on life support. We no longer have a local competition. The drought, safety concerns and the all pervasiveness of Australian Rules Football have seen to that. There’s a few of us that keep the flag flying. Somebody asked why I bother. I think this story answers that.